ASN students begin installation this week for their upcoming exhibition, titled ‘C’, at the Edinburgh Centre for Carbon Innovation. As part of the first collaboration between the Edinburgh College of Art and the Edinburgh Centre for Carbon Innovation, the exhibition will include provocative works responding to carbon in its many forms. 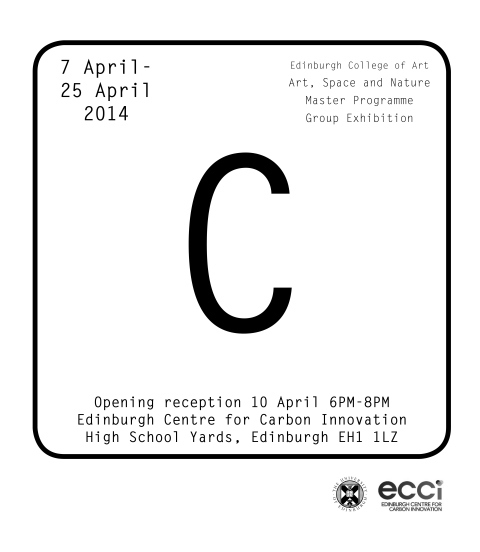 Works explore visual and interactive stimuli to the ECCI’s multi-faceted approach and ground-breaking research. The exhibition will run at the ECCI from 7 April-25 April, in conjunction with the Edinburgh International Science Festival, with an opening reception 10 April 6pm-8pm. RSVP to the opening reception via Facebook. This entry was posted on April 1, 2014 at 8:58 am and is filed under News. You can follow any responses to this entry through the RSS 2.0 feed. You can leave a response, or trackback from your own site.